The Cook-a-Palooza Experience: Comforting Sweet Potato and Leek Soup: Up your weekly veggie intake! This winter, more than a few us will go through a week consuming a minimal amount of healthy vegetables. Over a span of seven days, we can go from creamy pasta, to cheese omelettes, to chicken strips, with only a few healthy vegetables on the side. When I find myself in this situation, I totally redeem my vegetable-neglected eating habits by preparing a healthy and delicious vegetable soup. The biggest surprise with this Sweet Potato and Leek Soup: my two kids like it too! Their four thumbs up allows me to get super-nutritious sweet potato into their vegetable-deprived diet as well. 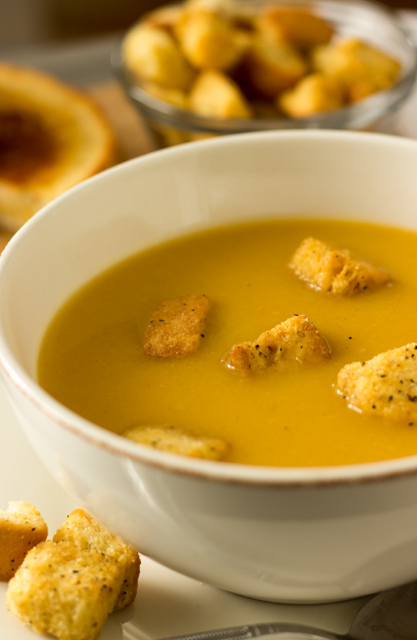 Toss homemade croutons on top and this soup is unlike anything you’ve tasted! However store-bought croutons will suffice when your time is severely limited. The only other decision you’ll be faced with is whether to use one sweet potato or two. I guess that will depend on how low your weekly veggie intake gauge is pointing. Enjoy! 1. In a large pot, heat oil over medium heat. Add onion (if using), leeks, and celery. Cook and stir until vegetables slightly soften, about 4 to 5 minutes. Add sweet potato, vegetable broth, and sage. Stir, cover with lid, and simmer until sweet potatoes soften, about 10 to 15 minutes. 2. 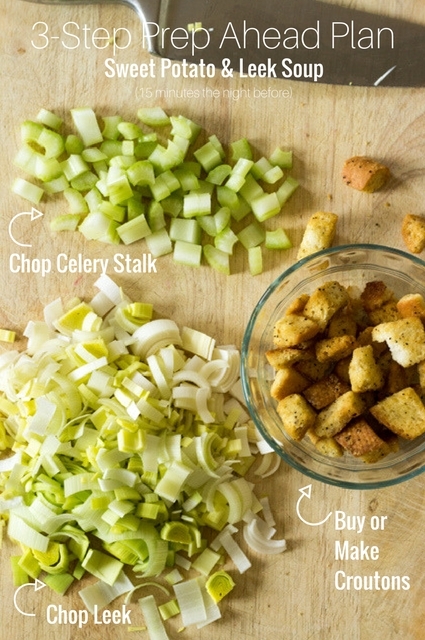 While the soup simmers, make the croutons. Heat 1 Tbsp. of oil, and butter, in a large skillet over medium-low heat. When butter has melted add bread cubes. Cook and stir constantly until cubes are toasted and golden brown on the outside, about 4 to 5 minutes. Remove croutons from skillet with a slotted spoon and drain on paper towels. 3. 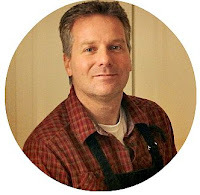 Puree soup with a hand-held blender, or blender, and season with salt and pepper. 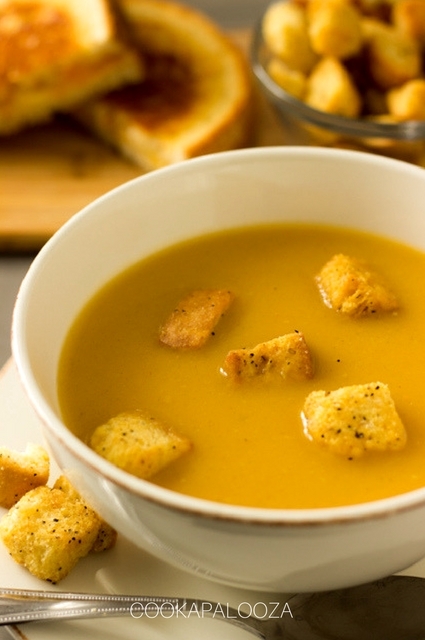 Ladle soup into a bowl, top with desired amount of croutons, and serve. Hi, Brent here! Thank you for checking my Sweet Potato and Leek Soup recipe. I look forward to getting your thoughts on this recipe and furthering our food conversation in the comments!